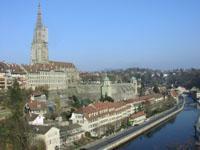 The Old City of Berne represents the adaptation of a medieval city into a modern capital. Berne was founded in 1191 by Berchthold V, Duke of Zähringen. After a fire in 1405, which almost completely destroyed the wooden-built town, the houses where rebuilt of sandstone. The medieval structure of the city originating from that time has remained unchanged up to the present day. After the Middle Ages, monumental fountains, the cathedral, patrician houses and large public monuments were added to the cityscape. 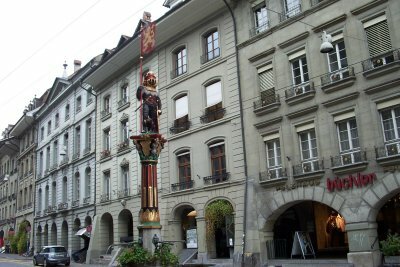 In 1848 the city became the capital of Switzerland. Currently, Berne has about 130.000 inhabitants. Despite its fair number of inhabitants, Berne is an easy town to explore. Actually there is one long road that crossects the old town. There you can walk under the covered promenade and admire the unique fountains. During my stay I enjoyed the tour to the interior of the Clock Tower the most. 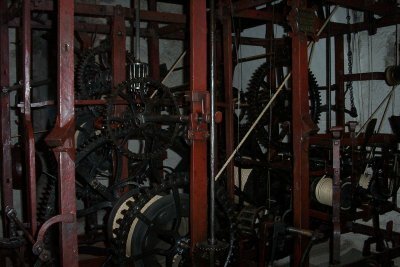 On this one hour excursion you get the chance to view the clock's medieval machinery in action. Another rather strange place to visit in Berne is the Bear Pit. Since ages Berne has displays live bears to remember where the city's name originated. Nowadays it's more like a zoo, but nevertheless an interesting idea when you know that bears have been kept here for so long. The reviews on this site about Bern are positive, but not exactly glowing, and I don't have much to add, except to confirm that it is a very pleasant city for a nice long walk. From the beginning of the Old Town to the Bear Pits, you basically follow one long street (with a small detour to the Minster) and admire the well-preserved medieval and Renaissance architecture on each side, especially the fountains and arcades. From the Bear Pits (recently renovated and well worth a visit - free of charge), you can enjoy a great view of the Old Town and the Aare River. On a crips and sunny autumn day, I enjoyed a few hours of sightseeing in this pretty city, and my stay was enhanced by a surprise Open Day at the Swiss Parliament (happens only twice a year). Bern can be easily combined with La Chaux-de-Fonds or the Jungfrau-Aletsch site, and is just a 1-hour train ride from Zurich and Lucerne. 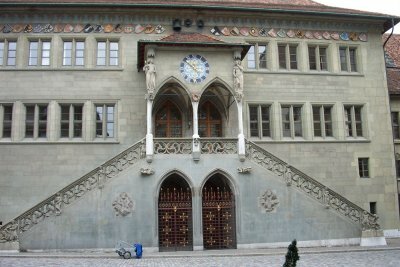 Given the tourist masses passing through Bern, especially from Asia, one would assume to find the crowning jewel of Switzerland. Given the scarcity of reviews on this site by community members as well as the brevity of those by otherwise verbose travellers (including Els herself), I already figured that this wouldn't be the case. 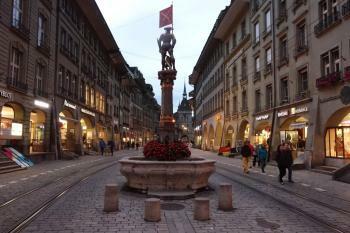 Bern old town feels very Swiss and distinct from northern Italian cities it shares many features with. Not sure if it's the clocktowers or the abundance of fountains all over the city. Personally, I enjoyed the views of the rushing Aar river best and the tucked away gardens found all over the city. As with many other old towns, Bern, too, would profit from finally kicking out the cars. They ruin the overall mood in the old town as well as many pictures. Bern is nothing to call home about. But if you are in the area and need a place to stay, you can tick this off en passant and you will have a few pleasant hours in the process. The clock tower tour (Zytglogge) seems to be the only unique thing to do. When I visited they only ran at 14:30h apparently, which didn't fit with my schedule. The tour can be reserved online. Bern is well connected by train to all parts of Switzerland. The closest site by distance would be the Jungfrau Aletsch Glacier. But in the time it takes you to get from Bern up the mountains (2h), you could also be in most other parts of Switzerland. The Swiss Travel Pass is recommended if you plan to travel by train. 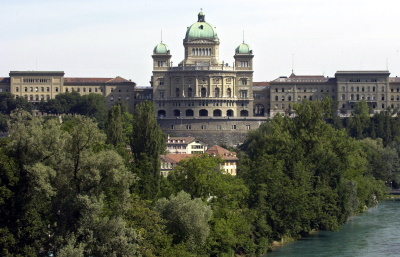 It also offers free public transport in Bern and free entry to select museums. You also get free public transport if you stay in a local hotel. The bear den is found outside of the gates. The original den has been enlarged via a tunnel to an external part that is way larger than the original part. When I visited the bears were staying there. The Zytglogge has a unique feature, that puzzled me quite a bit. They attached a public urinale to their most prominent site. Not sure why Unesco isn't intervening here. I visited Berne in July 2013. The old town is very easy to visit. There are plenty of shops and restaurants - the most unique and peculiar ones are below street level and accessed directly from the pavements! I really enjoyed walking past all the colourful folkloristic fountains in the old town. 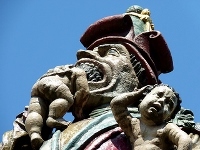 The astronomical clock is obviously a must-see but Berne has much more to offer. The view of the Aar River from the bridges on both sides of the old town is really great too. I was there in September 2003. Bern is a city with many interesting colorful buildings and fountains. Each fountain has a special theme and story. And the building also has unique designs. The cable cars run through the main street, carrying people around like in San Francisco. Churches and big clock tower are standing in downtown Bern; a peaceful and nice little town. Bern is a nice city. It is not so big so you can easily visit the touristy attractions by foot. There's lots of odd-looking colorful small fountains in the city, and when you cross one of the many bridges you have a beautiful view of the old city. The covered promenade has a lot of nice little stores. 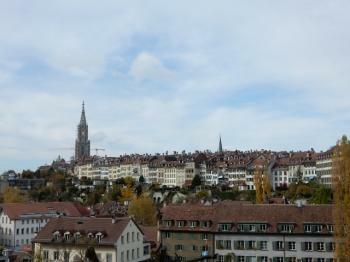 Saw Bern more than 30 yers ago, but still recall it as very picturesque. Not entirely a 'must-see', but certainly nice. Downtown Bern is outstanding, blocks of arcaded shopping streets, with a beautiful 16th century clock tower in the middle of the main street. Around the city we saw many very nice houses and apartment buildings, and the countryside and the Bernese Alps (mountains), within 50 miles of the city, are exceptional. After several visits, we think Bern would be our favorite city to live in Europe. The city name, Bern, means bear in German, so we went to see the famous bear pits, where the bears sit up and beg for food. The day we were there, they especially liked to eat carrots.